19 Mar A Germ-Killing Travel Robot? Yes! One day you will likely check into a hotel room or vacation rental that is below your standards. Whether it’s a rogue hair on a “clean” sheet, a pillow case that reeks of cigarettes, or a duvet cover that has seen fresher days, the bed of your nightmare is out there — but there is a way to prevent your trip from starting off on a germ-filled foot. CleanseBot, a patent-pending robot, has been developed for just this type of occasion. The pocket-sized technology can sanitize and disinfect surfaces — including the hotel bed — and is equipped with a UV-C light that is said to prevent the spread of airborne viruses. Launched on IndieGogo, a crowdfunding platform, on Jan. 6, the robot had already raised more than $1.3 million. According to its page on the site, in a study conducted by an independent third party, the CleanseBot was found to kill 99.99 percent of E.coli. The CleanseBot has three modes. The first is an automated setting that cleans underneath the bed’s blankets and can be set for 30 or 60 minutes. The second, the handheld mode, cleans smaller objects, like the alarm clock, phone, and T.V. remote — likely the germiest item in your entire hotel room, a surprising study found. The third mode, the powerbank mode, is for charging the device. 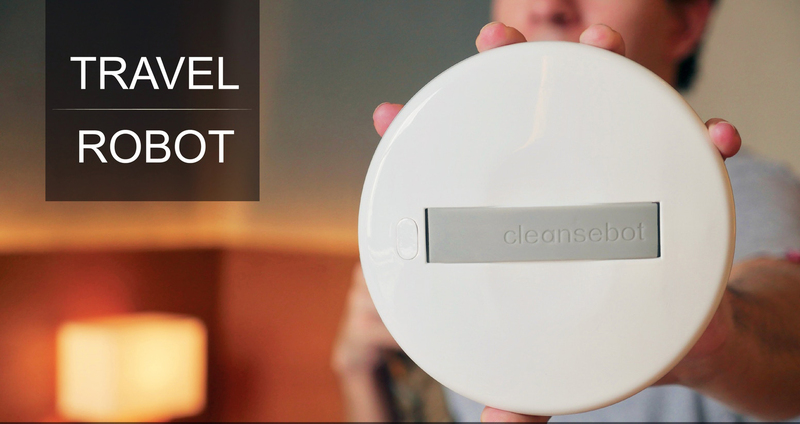 The CleanseBot can run for four hours before needing a charge.